In the run-up to the first meet of the year, it seemed likely that we would be spending a wet weekend sat in a Lakeside pub, by a roaring fire, contemplating the drizzle outside. Whilst not a totally unappealing prospect, it was with great pleasure and anticipation I found myself stood in new B2 boots, at about midnight on Friday, watching Robin and Michael push the Club Joker (Paolo’s much-loved van) up through the fresh snow above Coniston. It looked like luck was on our side for a mini-Alpine break. Vans and cars parked, we eagerly (but with some difficulty) found our way into the Barrow Mountaineering and Ski Club’s hut. Expecting to soon be snug and warm in this rustic edifice, our plans were put on ice by the fact no one had been there for days and, barring all of the club property marked “DO NOT BURN!”, we had no wood for the burner. So we jumped straight into sleeping bags – our own of course, it wasn’t that cold – and got some kip. The next day was all white. Thick cloud had descended so low across the hills that it almost shrouded the chimney of the hut. 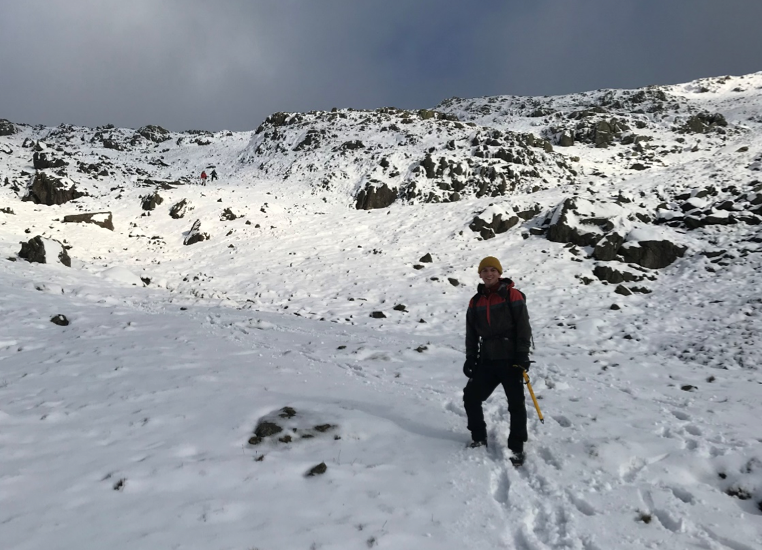 We geared up with crampons, axes, map and compass, and set off on an ascent of the Old Man of Coniston. We had optimistic hopes that we could climb above the cloud and, if so, Simon had his eyes on a good looking ridge walk. Going was easy as we wound around the hill past the ghostly structures of abandoned mine works. Navigation was also simple as we could literally follow in the footsteps of those who had come before us. 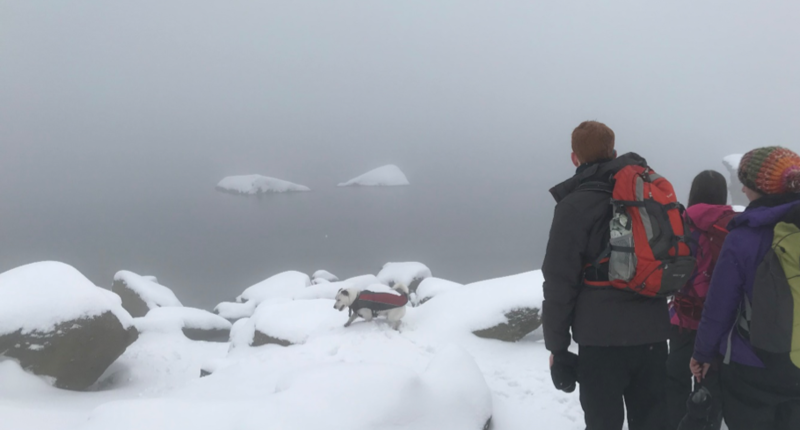 We soon arrived at a misty tarn and, having determined there was no need whatsoever to contemplate a dip in the water, began the trudge up to the summit. A dog in the snow – what’s not to like? Once there we all got very cold, very quickly. We also found that visibility was down to about 15m. This rather dampened our enthusiasm for a long “picturesque” ridge walk. 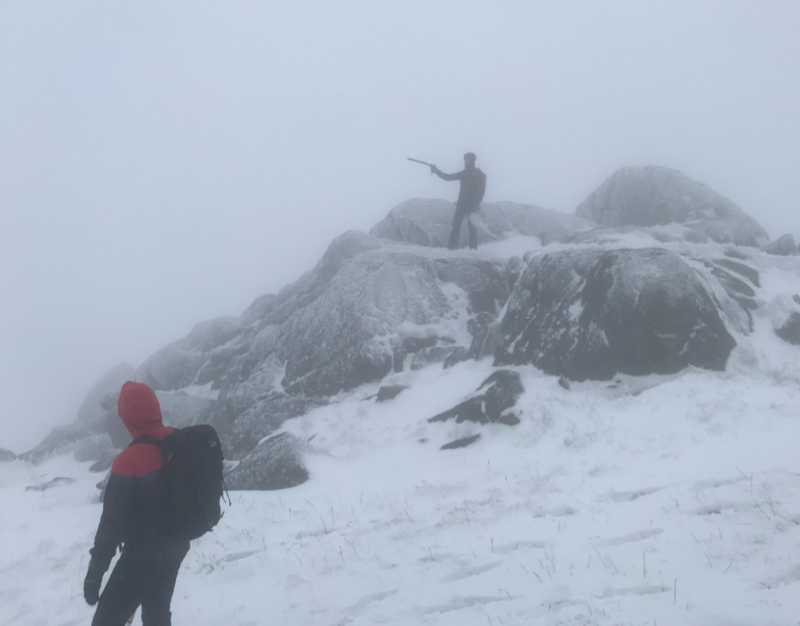 Given the conditions we may have well spent the next three hours walking in ever-decreasing circles around the summit cairn. A quick committee meeting therefore determined that we should descend the Old Man via Goat’s Water. All this required was working out where on earth Goat’s Water was! Cairn you believe how icy it is!? 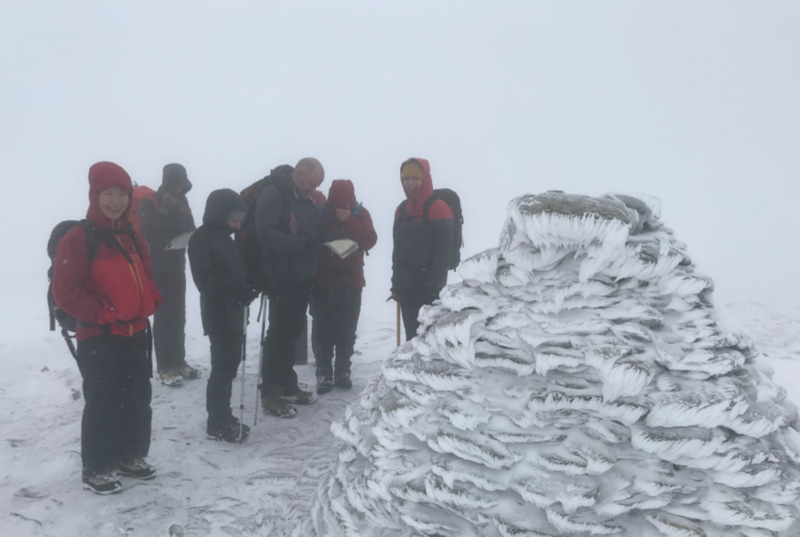 Simon gamely took on navigation duties and the first instruction was to follow the cairns down a gentle slope away from the summit. Paolo and I raced off down the line of cairns and were immediately on our own with no-one in sight…thankfully everyone soon caught us up and we resolved to stick more closely together (well, specifically to Simon, with his map and compass). By a particularly ice-strewn cairn, we took a bearing and began a more enthusiastic descent steeply down. Ice-axes were readied and Ollie showed as the way. The descent was mostly without incident save for Michael’s continous endeavours to slide down the hill (presumably in an effort to practice self-arrest). Michael’s technique for this essential alpine skill was curious given that he had omitted to take his axe out of his rucksack. Luckily he had Susan and Charmian’s encouraging laughs to spur him on to greater things. He responded by kicking off a tremendous snow-ball fight. Having reached Goat’s Water, conditions cleared up and we enjoyed a gental traipse back to the hut for thankfully warm showers. Sunday dawned brightly and (miraculously, given the previous night’s curry) we all seemed to have enjoyed a restful night’s sleep. Throwing the hut doors open for ventilation we saw that, save for a beautiful patch of mist in the valley below us, visibility had improved greatly – it looked like we were in for a classic. And so it proved to be! 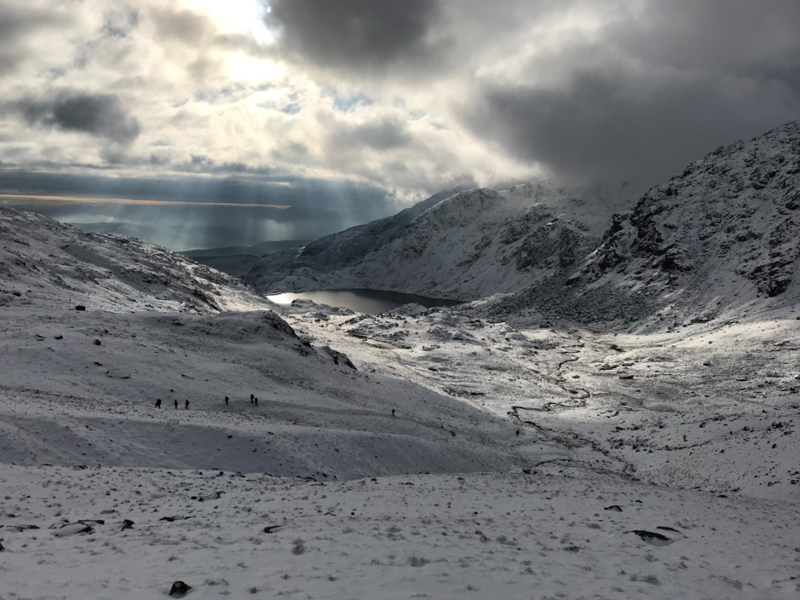 We all had a spectacular walk up Wetherlam where there were extensive views of the whole lake district around – including towards Langdale and Scarfell (check out the gallery). 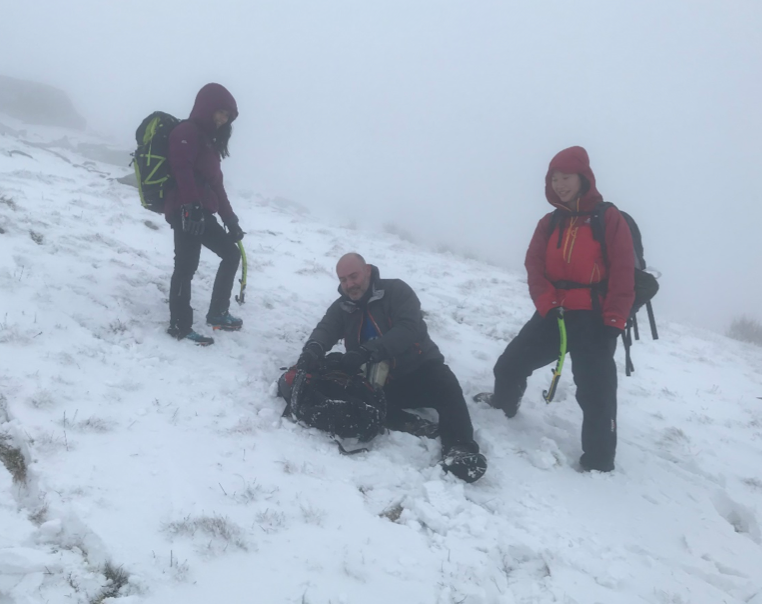 The clear conditions held the whole day and I had no excuse for not spotting the piece of boggy ground that swallowed my right leg (up to the thigh) as we descended back to the hut. Sadly the better weather was also melting the snow and, as we dropped off the high ground, much of it was disappearing before our eyes. Like the end of classic Christmas cartoon, The Snowman, our wonderful snowy adventure had come to an end.